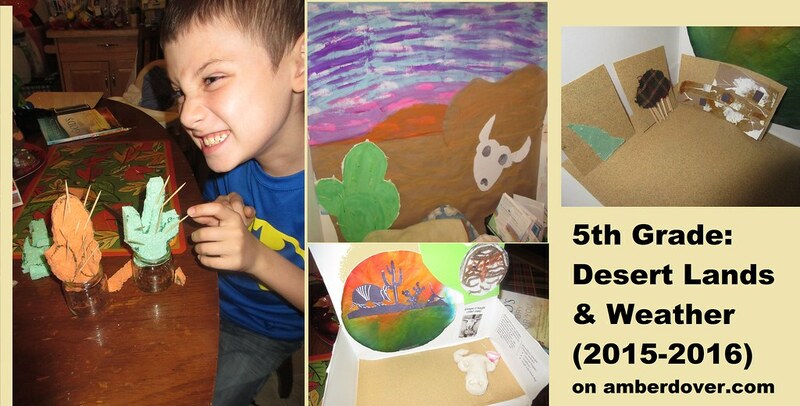 In this post: Desert diorama and art, Georgia O’ Keeffe inspired salt dough art and the Three Little Pigs’ desert homes. Hello, dear ones! Here’s an Advent break for my 3rd post of our 5th-grade studies from last year. We learned about desert lands in geography. We studied weather for Science. Michael read the book Holes, which is about a kid who is wrongfully sent to a work camp in the desert. All the “bad” kids have to dig holes, and they begin digging up artifacts and an interesting history. There’s a good movie that goes with the book. Anywho, here’s what else we did. Desert Scene in the School Room~ I painted a desert sunset on paper. Then I cut out the cactus and skull from poster board. I pasted tooth pics on the cactus. Sponge Cacti~ Michael cut cactus shapes out of sponges and glued tooth pics for the spikes. We put them in jars of water to show how Cacti store water. Georgia O’ Keeffe style skull, yarn owl, & coffee filter cacti in a Desert diorama~ We used salt dough to make the skull. Georgia O’ Keeffe was an American painter who painted several desert themed paintings. The yarn owl is an Elf Owl in a cactus. We cut out a desert scene silhouette and pasted it on a painted coffee filter. We used food coloring and water. Sand paper is at the bottom of the diorama. The three little pig’s desert homes~ a yurt, Hopi house (pueblos), and a Bedouin tent~ Michael wrote the story of the Three Little Pigs from the wolf’s perspective, in his journal. Then he made their houses to go with our geography lesson. Michael used cloth, sand paper, and strips of paper. Spelling with beans~ I wrote letters on dry beans with a Sharpie.